30 other mice and seemed really happy to have her own food now, so could she have just eaten a lot and became slightly bloated? She definitely didn’t seem this round when I first got her. I can’t really add photos right now because she isn’t really comfortable enough with me to a point where I can get a good one, but I’ll make sure to add one when I can. Please let me know what you think! Ok, so I got a photo. She doesn’t really look pregnant in the photo, but when she is walking around and moving, her belly does seem to bulge out. I’m not sure, she may just be a bit chubby. I’ll probably wait and see if she gets bigger. This happened to me with my mice when I got them, as I gave them better food. No matter what, don't rule out pregnancy. If she was in a cage with many other mice, a couple could've been misgendered. I'd watch her for the next couple of days. You could try introducing her to other female mice (if you have any), as other does may try to help her out when (if) she has babies. Thank you! She reminds me so much of a little pearl. I am going to be introducing her to my other girls in a week or two, I just want to be completely sure she doesn’t have any sort of illness that could be passed over to my others before introducing her, though so far (knock on wood) she seems completely healthy. I’ve already read through the breeding packet so I can be prepared if she does happen to be pregnant. @PeachesandPepper92918 wrote: Thank you! She reminds me so much of a little pearl. I am going to be introducing her to my other girls in a week or two, I just want to be completely sure she doesn’t have any sort of illness that could be passed over to my others before introducing her, though so far (knock on wood) she seems completely healthy. I’ve already read through the breeding packet so I can be prepared if she does happen to be pregnant. 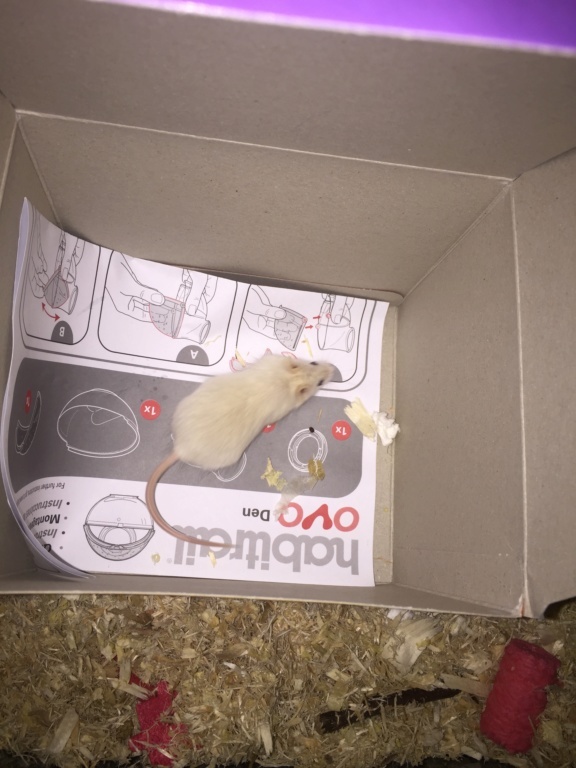 Update: okay, I’m pretty sure Pheobe (my newest mouse) isn’t pregnant, just a bit chubby. She is also just such a sweetheart! She still needs to get used to movements, but she does start popcorning when I put my hand in the cage and likes to try and groom me ( picking off pieces of bedding that are stuck to my hand, giving me kisses, gently nibbling me). Mice are just such great pets!